It’s been a while since I posted, so a few of my Friday Farm Fotos seemed like a good place to start. We’ve been having trouble with our internet connection, which is one reason (among many) that I haven’t been on here so much. Yesterday the company finally sent someone to check the pole and line that drops to our house, and worked on it. The guy said it looked like it had been hit by lightning at some point. I am hoping they have truly found the problem this time! Time keeps on marching, and here we are in April! Good Friday, with the Easter weekend coming up. Around here we don’t have anything special planned. Some of the family, however, is spending Easter in Paris. Another quick post! I’m trying to finish up the main part of a writing project today! So here are a few pictures from around the farm this week. 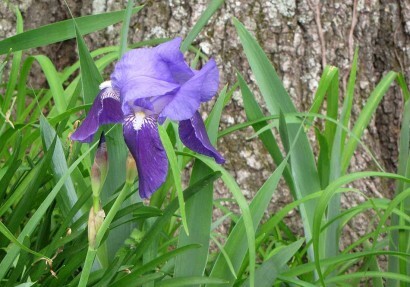 . .
We are getting more and more iris blooms in the flower bed around the big oak tree in the front yard. Purple is one of my favorite colors. At this time of year, it’s easier to see how far up in the oak tree by the end of our driveway that the rambling rose has climbed. The leaves of the rambler come out before the tree leaves. Even at that, it’s kind of hard to show up in a picture, since there are so many trees in the background. 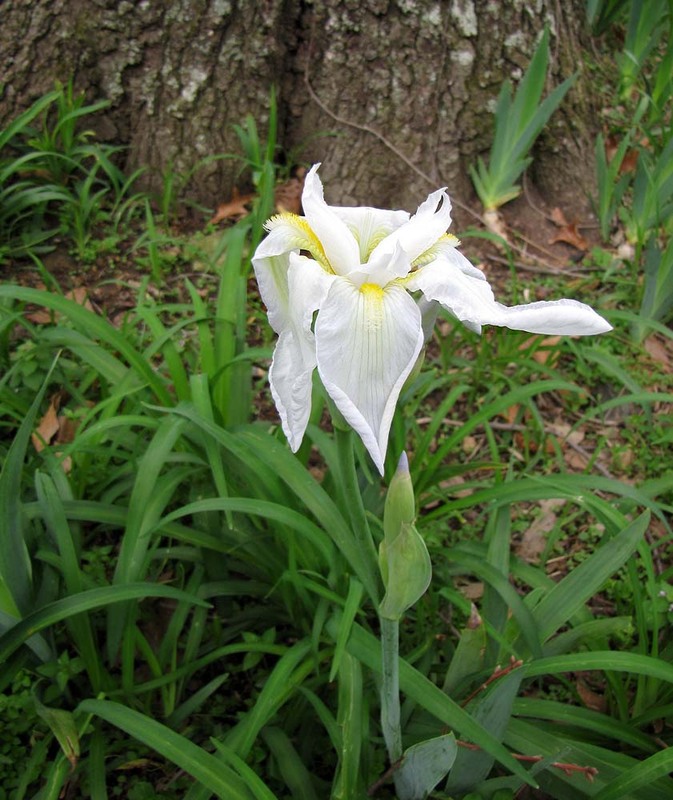 It’s pretty impressive when it blooms, but it’s one of those sights that somehow just translate well into a picture. Nearby, our two dogwood trees are in bloom. 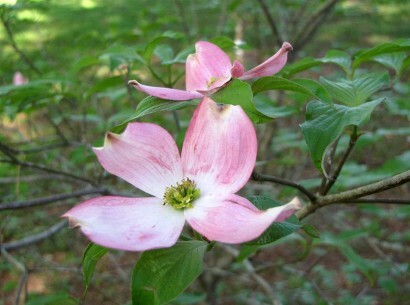 One has the traditional white blooms, and one if a “red” dogwood. 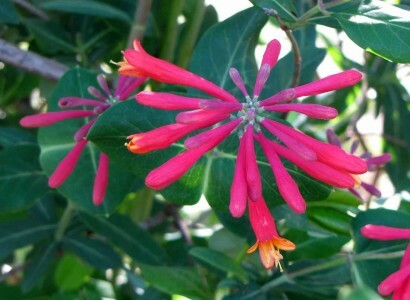 The honeysuckle is also blooming, which the hummingbirds love! Of course, what with everything blooming and producing pollen, there is a lot of stuff clogging up the gutter. Big clumps of stuff falls out of the trees and lands in the gutters and on plants below. 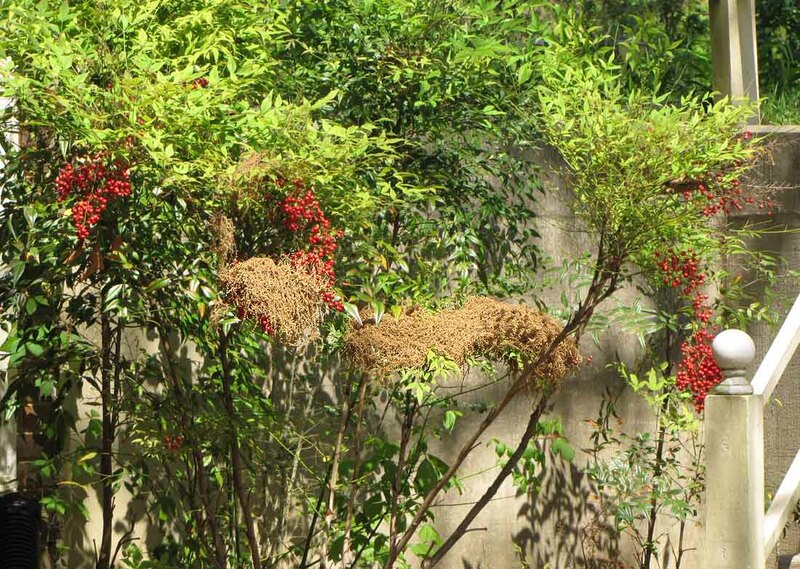 Clumps of tree "pollen" stuff on nandina bamboo. The sheep are enjoying all this nice, lush spring grass. And of course, you can also hear the sounds of springs. 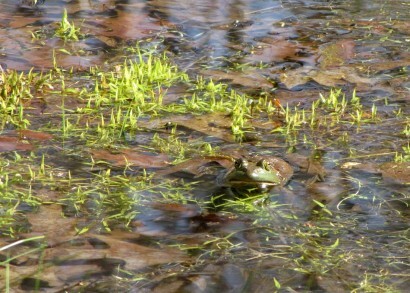 The frogs are getting very noisy, both in the pond and in the bog area of the bottom pasture. 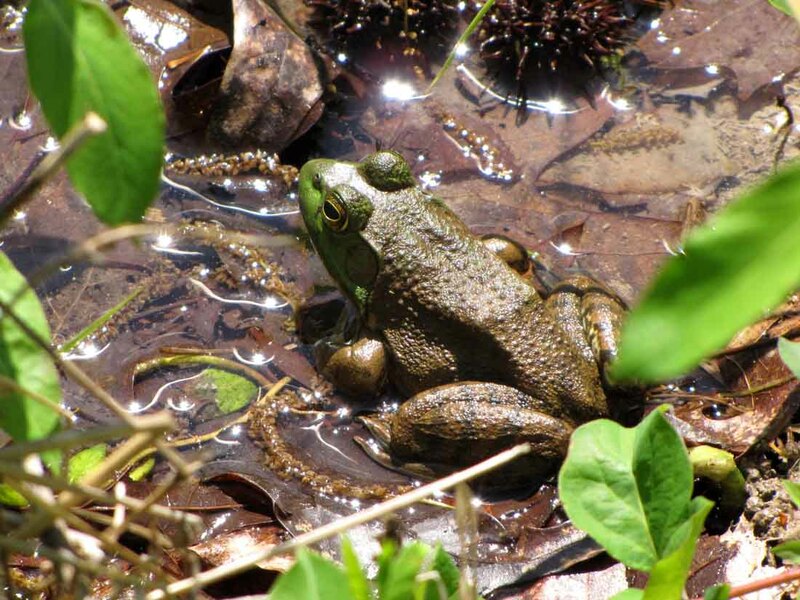 The bullfrogs lend a deep bass note, while the smaller frogs put in a tenor note. Waiting for the next song. . .
It’s a normal springtime. 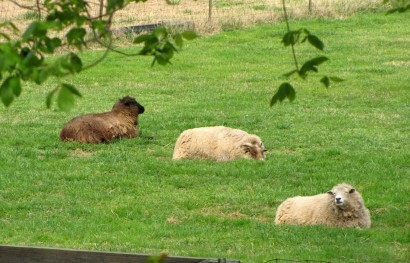 I miss the lambs and goat kids we used to have, but not the work, or the heartbreak when one dies. Another week has slipped right by. Spring is in residence most of the time, although old man winter rousts her out now and then for a light frost or some nippy weather. But flowers are blooming and birds are nesting and the peacocks are screaming, so it must really be spring! 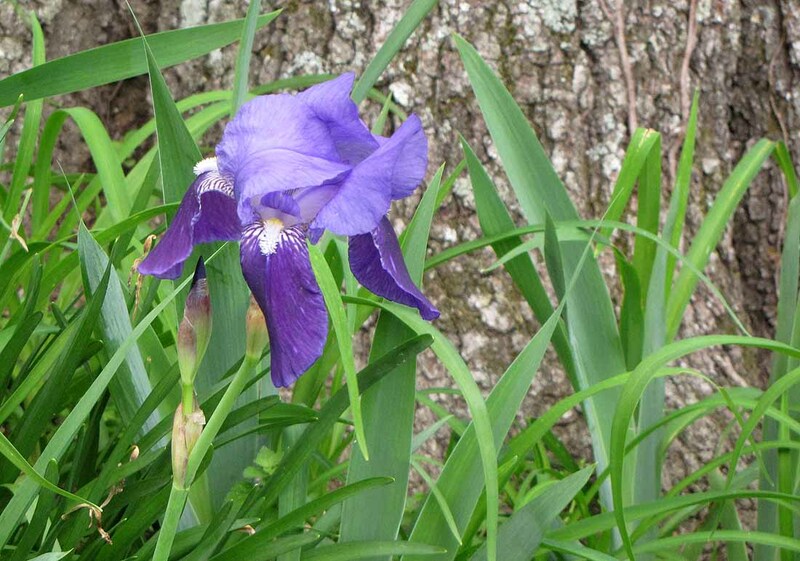 I saw the first iris blooming in the flowerbed around a big oak tree in our front yard. 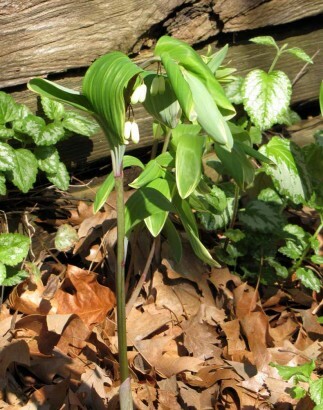 . .
And the Solomon Seal is starting to put out little dainty bells of bloom . . . 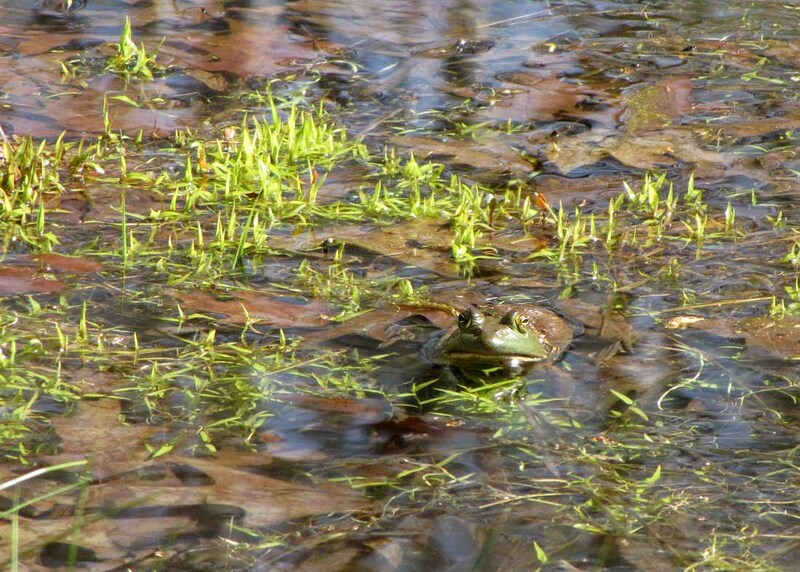 The Farmer saw some of the pond denizens out enjoying the warmer weather . . . Turtle at the edge of our pond. The frogs are also hopping all over the place. I guess they’re just hoppy! 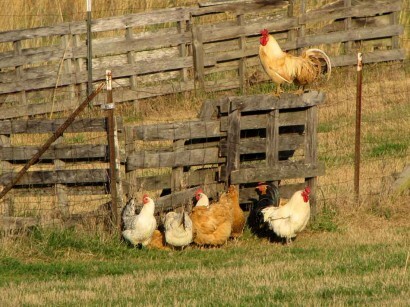 Another day I saw a bunch of the chickens congregating in the evening. I’m not sure if it was a chicken conversation or a conversation of chickens. 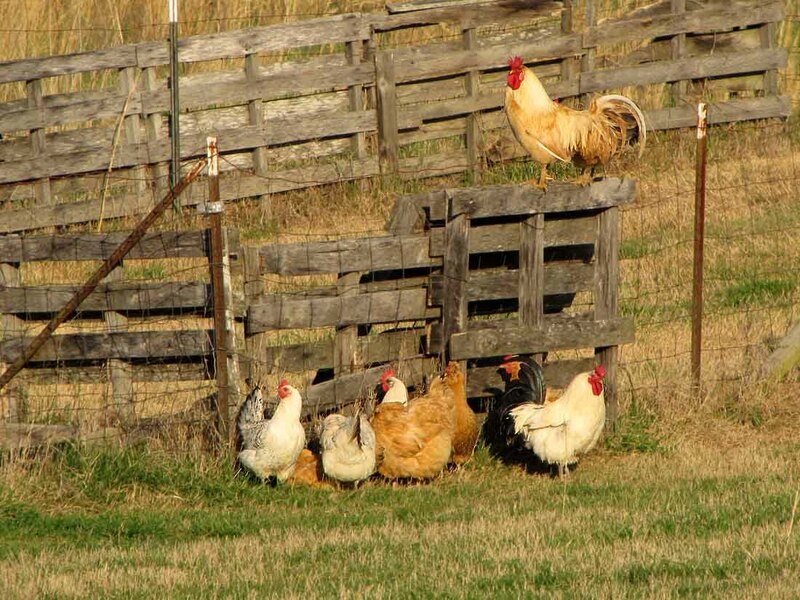 It’s not exactly a hen party, because too many roosters are attending this event. They’re not the only ones who hand out together. Here’s a line-up of the happy hoofers. 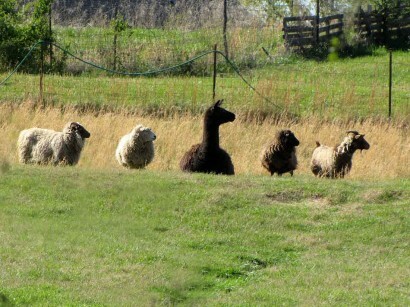 . .
ewe, ewe, llama, ewe, goat. . .
And now I must get back to work. I am determined to finish up this book project! Last night we got more snow. 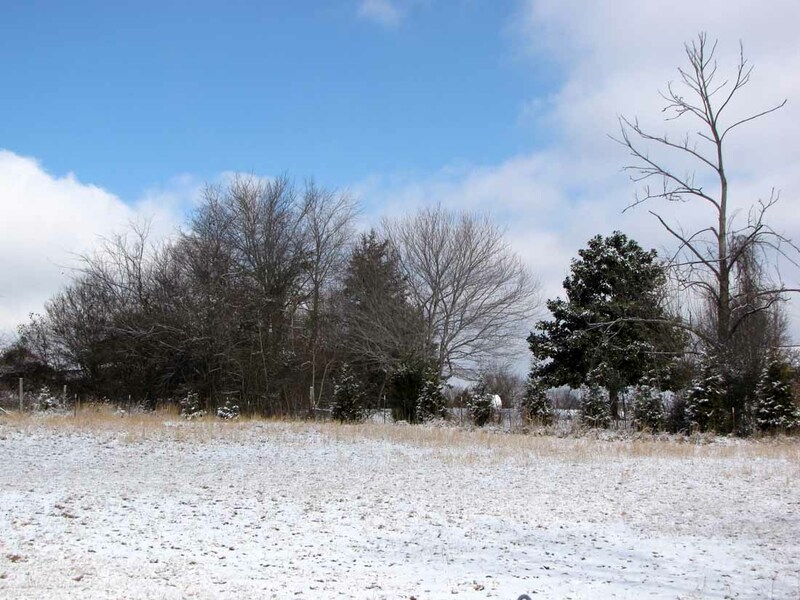 Nothing like the previous snowfall, but still. 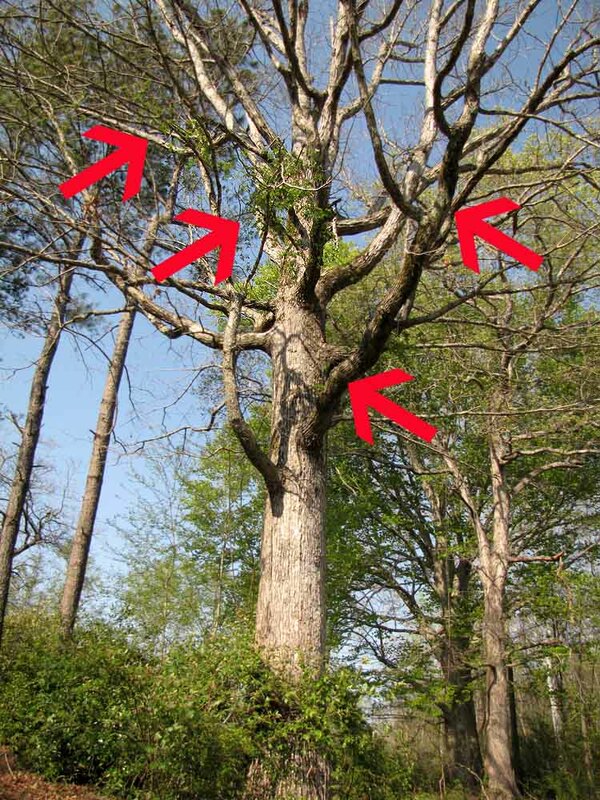 This is the SOUTH, so …. 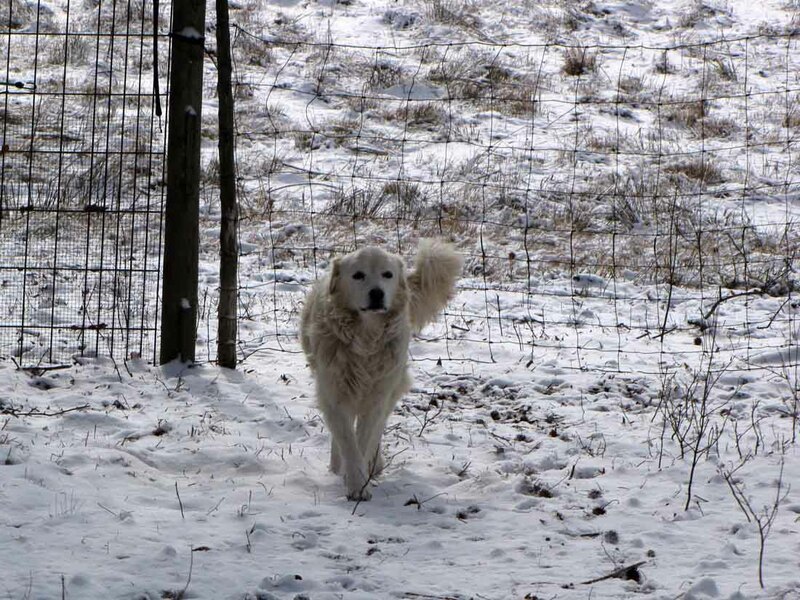 Our Maremma sheepdog, Neffie, doesn’t look too thrilled with the snow. I agree with her. Granted, it’s just a light blanket of snow. . . 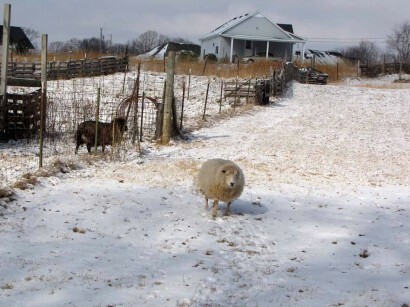 The sheep don’t care about the snow, whether we got a lot or we get a little. Rural Ramblings . 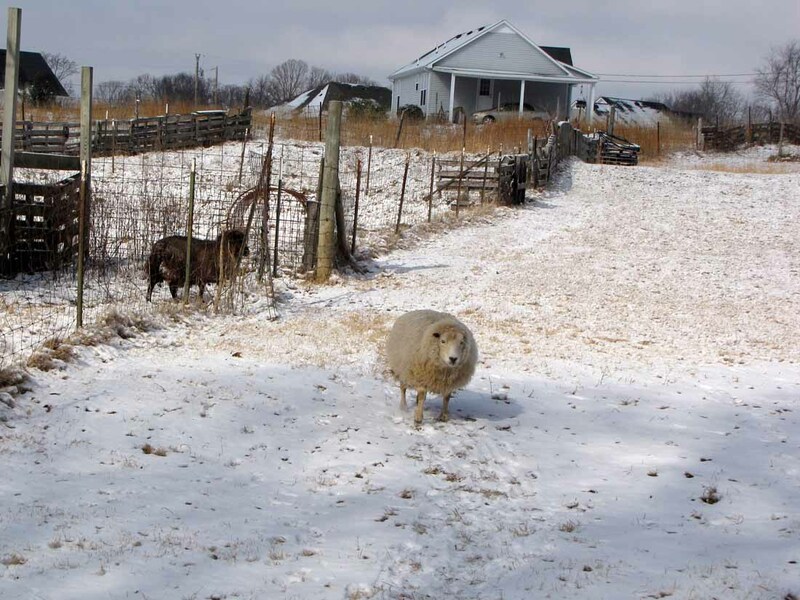 . .
We're living the country life and hobby farming in the southeastern U.S. We've become a bit of a retirement home, with one ewe sheep, a female goat, and a pet llama that are getting "up there" in years. We also have chickens, turkeys and guinea fowl. To keep all the other critters safe, there's a Maremma sheepdog here as well! I love to take pictures so there are lots of images to go with the stories! 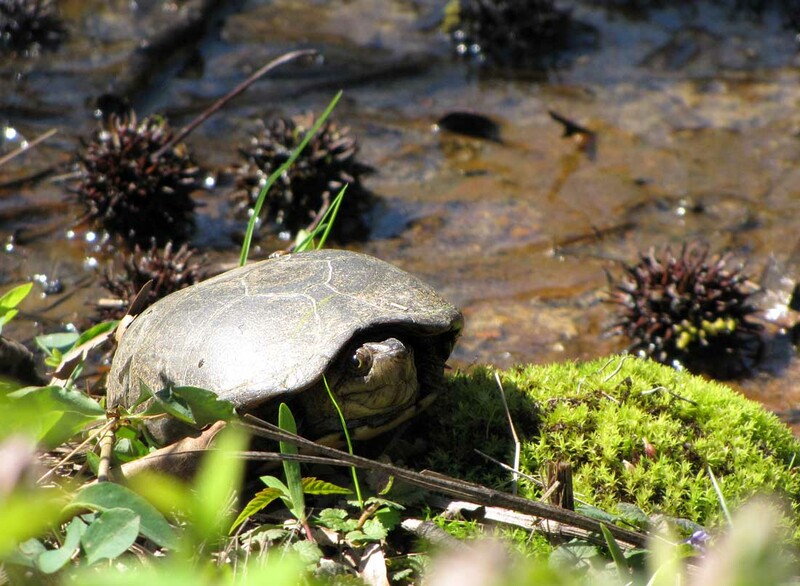 Not just of the farm critters, but wildlife and nature shots too. Plus some pictures from far afield now and then, when we do a tad of traveling. So sit down and visit a spell! Ivan Scheepers on What Happened to the Parrot? Sharon on How did that happen?